The biggest mistake I usually see are owners spending too much money building an internet site and loading it with a database from an e-Commerce catalog and expecting online sales. What separates you from the other 2,500 sites with the same data? Have you heard the latest change from Google - "RankBrain? Drive the right type of traffic by a long-term organic search strategy. Create unique product offerings that separates you from the pack. Syracuse based building service contractor. Re-launched in fall 2018 we redesigned their internet site to comply with the new standards all while implementing modern elements. The site is optimized for all mobile devices while operating under an SSL. This site satisfies the requirements of the popular search engines. 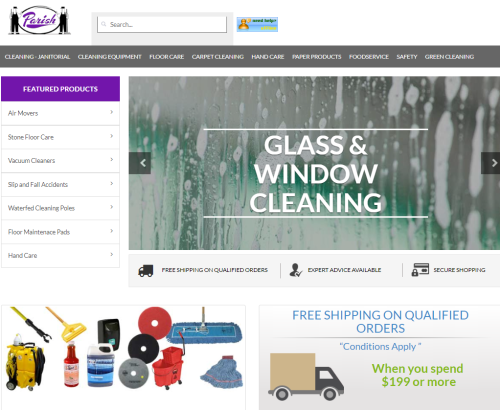 Launched in in 1998 Parish-Supply.com began its first e-Commerce offering. Throughout 20 years of development our platform grew from a static html site to a database driven .net platform. 2014 we implemented a CMS (content management software) where a our users could effectively update the site from any virtually platform. This concept allowed us to make changes to the site, on the fly, instantly. 2017 the site was converted to a responsive design, thereby offering the user a cross-platform browsing experience. The site was tested and verified for use across tablets and phones. 2017 sales for Parish-Supply.com reached record sales in online revenue. Launched in early 2018 we created an identity brand that presented the user with a feature rich site. Complete with a broad offering of specifications, features and photo library. The concept of the site was to direct the user to purchase products from authorized dealers in the USA. Similar to CAModel-USA, launched in October 2017 we created an identity brand that presented the user with a feature rich site. Complete with a broad offering of specification, features and photo library. The concept of the site was to direct the user to purchase products from authorized dealers in the USA. Launch date 10/01/2017, increase in sales = 450 percent.